RemotePC is a remote access application that makes it easy to gain access and control over a remote computer, with useful options for team collaboration, file transfers and remote session recording. You can use the program to connect to one or more remote machines, and it must be installed on both your computer and the remote workstation(s) you want to connect to, configured for remote access with an assigned name and access key. 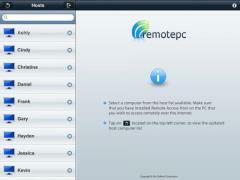 Also, you will need to create a RemotePC account in order to use the app. The application lists all workstations which are set up for remote control, and a new session can be started by entering the correct access key. What’s more, RemotePC’s connection can be optimized for speed or quality and it provides various options during a remote session. For example, you can transfer files between your computer and the remote PC, chat with the remote workstation’s owner, as well as record the session as an AVI video file.